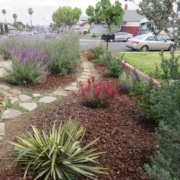 After moving to Santee and experiencing the extremely hot and dry summers, Melanie knew she needed a landscaping change. Once the existing turf was removed from the front, she worked in small sections of the yard until the design came to life. In addition to water-wise plants, Melanie added decomposed granite and flagstone to create pathways, and cedar bark in between the plants. 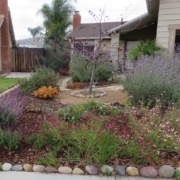 She converted the existing sprinkler system to a drip system. These days, the front yard is frequented from morning until night by hummingbirds, robins, fly-catchers, turtle doves, and lizards. The neighbors enjoy stopping by for a few minutes to take in all of the activity. 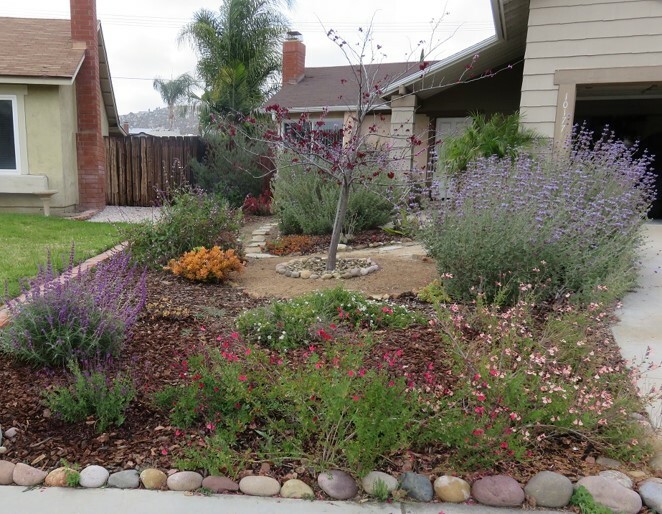 Karen & Brian removed their entire front yard to create a cool and serene color palette that highlights the amazing native plants that thrive in East County.